Although my main interest is the Midland I found it hard to resist at least a couple of GSWR 6 wheelers for a 4mm broad gauge layout if I ever get round to building one. The coaches were released as a set of 5 coaches about 20 years ago when the business was owned by Paul Greene an S Scale modeller Kilbrandon is based on Killorglin on the Valencia Branch. http://www.s-scale.org.uk/gallery15.htm. The 6w brake 3rd caught my eye with its gas lighting, birdcage look out and skylight lasting in service into the late 1950s, most of the GSWR 3rd class coaches seem to have been converted to carry turf during the emergency with the slightly more spacious 1st & 2nd class coaches remaining in services into the CIE era, the slightly more modern and spacious MGWR 5 compartment 3rds replacing the 6 compartment GSWR 3rds on branch line and suburban trains even in deepest GSWR territory. I started the assembly saga on my Tales from the Carriage Shop thread but though building these coaches was worth a separate thread, with relatively few modellers apparently prepared to assemble a metal kit or attempt a scratchbuild. These coaches are a fairly advanced design and relatively easy to assemble compared with a high proportion of the etched brass coaches produced by UK manufacturers. The SSM coach kits are available complete with wheels and are basically designed for slot and both together construction, I use solder for joining the majority of components and sub assemblies as its faster and stronger than epoxy or superglue. I used an 18 Watt Antex iron with 145 degree solder and a citrus based flux available from DCC Concepts for most of the assembly work on this coach. I wash the sub assemblies in warm water to remove flux residue after soldering and store in an ice cream container as the combination of acetic acid (citrus) and heat during soldering tarnishes the brass and leads to verdigris. Hinges are represented by strips that slot through from inside the coach, much simpler than fixing individual hinges supplied with some kits. Hinge strips soldered in place, end steps fitted in a similar manner. Hinges fitted, guards lookout or ducket before fixing, the ducket sides have tabs that slot into the side of the coach. Ducket sides soldered in position. I flux the joint and pick up a very small bead of solder on the iron to minimise the clean up needed. Strip of waste brass clamped to inside of ducket with stainless steel clip for soldering, hand vice on right. Rear of ducket with reinforcing strips/spacing strips fitted. I kept the strips a min of .4mm back from the edge to provide a seating on the ducket edges. ¾ view of coach very little cleaning up of solder required with steps, hinges slotted through from inside the coach. Possible mid-late 1950s passenger train, 4w luggage vans were regularly used with 6w stock on branch line and secondary workings. Wonderful work looking fabulous. Filled with nostalgia looking at the subjects and the brass workmanship. Now to put a roof on it! The roof is supplied flat and can be formed by forming/rolling back and forth with a suitably sized dowel, piece piece of metalrod or broom handle on a resilient surface, towels , or even foam camping mat/track underlay or rolling bars if you are into metalwork. I got these for forming roofs for the tin vans, also use them for rolling loco boilers and anything curved. Test for fit, the secret is to form the curve gradually and test as you go, I use a special bending jig in conjunction with the rollers for forming roofs on modernish stock with compound curves. The birdcage look out and skylight in the luggage area gives these vans a lot of character, the outline of the skylight is half etched on the roof and the designer has thoughtfully provided holes in the corners for starting a saw cut. The piercing saw with a fine toothed blade is one of the traditional tools used in scratchbuilding locos and rolling stock. Cut out formed in roof now to tidy up with a file. Assembly of the birdcage is simple slot and tab construction everything fits together accurately, I use plenty of flux and the minimum of solder between the base and birdcage frame, the stainless steel clamp is to hold the frame in position while soldering. I managed to find the skylight after a thorough search of the workbench (which turned out to be in a good thing in a way as its more organised). The base (rectangular shaped piece with large cut out) basically sits on the roof and is held in place by the sides which fold up into a U shape & the skylight fits on top. I used an 18watt Antrex iron with very very little solder on the tip for soldering on fine detail. The roof assembly is removable and is screwed in place on top of the body. The grills in the bottom right hand corner are for a dog box that seem to have been filled in in CIE days, I am in two minds about keeping this feature though I have filled in the grills and holes and grills on the opposite side with solder. I have been dunking the completed brass sub-assemblies tin boiling water to neutralise the flux residue after soldering which seems to be keeping the model very clean, basically eliminating problems with salts and verdigriss that arise after rinsing with warm water and detergent, the only downside is that parts glued with super glue fall off, and is totally unsuitable for whitemetal parts/kits assembled with low melt solder. Soldering/hot work nearly completed, fitted compartment drop lights (leaving some part open) and detail castings. Forgot to add the rainstrips to the roof! Gas cylinders and buffers added. I st pre-tinned the brass in the area the whitemetal casting is fitted with 145° solder, then soldered the casting in place with 100° solder using a temperature controlled iron/soldering station set at a lower temperature. Low temperature solders traditionally used for soldering whitemetal such as Carrs 70° solder (highly toxic) did not form a reliable bond with sheetmetal. Pre-tinning with 100° solder was more of an insurance policy although the characteristics of the solder appear to be quite different. The roofs of GSWR (&BCDR) coaches were quite distinctive from railways that used electric lighting like the GNR and MGWR bogie stock, with prominent ventilators and light fittings. The GSWR used coal gas for coach lighting, with gas lit stock remaining in service up to the early 60s. The gas was manufactured in Inchacore and distributed around the railway system in twin tank wagons. Gas and oil lit coaches usually had steps and grabrails at each end for maintaining the lamps, though the MGWR used ladders for accessing the roofs on oil lit coaches. Interior partitions and floor are in plasticard with moulded plastic seats. I generally build coach interiors as a sub assembly that can be painted and finished separately from the coach. This arrangement is not feasible with the SSM GSWR coaches (with the top and bottom flange) unless you assemble the coach with one or both of the ends removable. The partitions locate between slots in the top and bottom flanges. I used a NWSL duplicutter to cut the partitions to a uniform height and width then cut the tabs with a craft knife. I am planning to paint and fix the partitions, floor and seats as separate components and add the odd passenger once I have painted the coach body. Partitions were sometimes matchboarded, which could be done using Evergreen embossed styrene though I am not sure if this would be noticable on a completed coach on a layout. Very nice. Looking forward to the painting. How is the roof attached? Superb work. Question - as I have some of these on order - what radius will it comfortably go round? Question - what radius will it comfortably go round? Difficult to give an answer for OO gauge as my coach is set up for 21mm gauge. 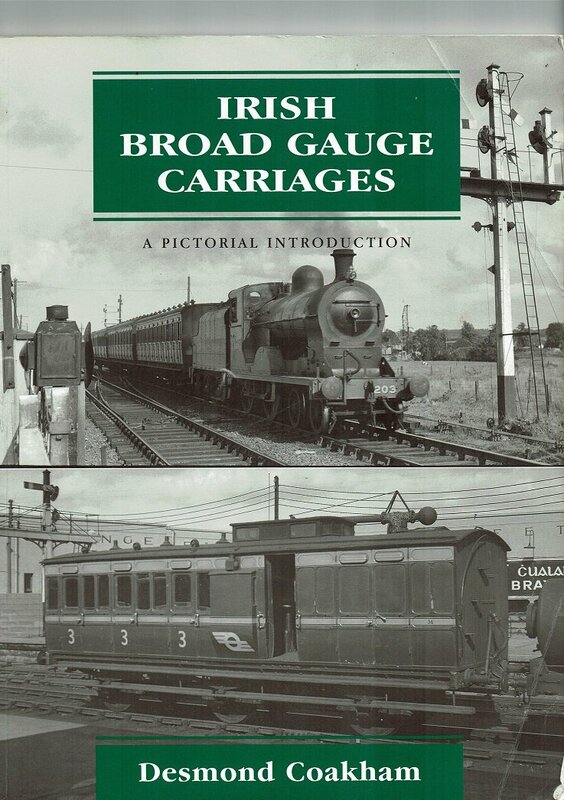 These coaches should be able to go round relatively sharp curves in OO on account of the 1½ bogie arrangement and the increased sideplay between wheelsets and underframe as a result of using the narrower gauge. Could be a long time before I get around to painting, toying with the idea of GSR crimson or purple lake as a change from CIE green, just need to organise some decals. I missed doing a section on the roof, SSM use a captive nut and bolt system for securing carriage roofs, which allows the roof and body to be separated for adding detail and painting. Coach body and roof, transoms with 10BA captive bolts slot into top flange of body, wing shaped profiles with 10BA nuts soldered to roof. Basically the transoms and roof profiles are 1st bolted together and the nuts soldered in place. small drop of gear oil on the bolt thread prevents soldering the nut and bolt solid! Roof secured temporarily in place with masking tape or fine wire until the profiles are soldered to the roof. On most coaches the roof can be removed (using a long screwdriver from below) without separating the body from the underframe, the 6w Bk3rd is an exception as the body and underframe have to be separated before removing the roof if you want to keep the area below the luggage compartment skylight clear. Final installment at least for the moment! I added the rainstrip using 0.45mm straight handrail wire rather than from the coil of phosphor bronze wire supplied with the kit as it is easier to curve the straight wire than straighten something thats in a coil. I was planning to use a paper template for the curve but it was easier to simply let the wire form the curve clamping in place at each end for soldering using Micro-Mark mini clamps https://www.micromark.com/Micro-Clamps-Ss-Smooth-6. I first fluxed the joint with a citrus based flux, then ran the soldering iron along the joint, feeding DCC Concepts easy flow 145°detailing solder into the joint. The DCC Concepts detailing solder is easy to control for this type of work as its in a very fine wire form. I cleaned up any excess solder with a fine scraper and a fibre glass brush after first neutralising by submerging the roof in hot but not boiling! water. I will probably paint this coach once I have completed the 4 compt. 1st. I will fit ducket roofs and guards lamps once I have painted and glazed the coach. Other jobs include replacing the 28mm pin point axles with 26mm plain axles (available locally), making good around the dog boxes, replacing the window ventilators and fitting handles and grab irons once the coaches are painted. I take my hat off to you John. Absolutely superb work. A true 'Brass Master'. Reading back through the post I can see the extensive and diverse range of excellent brass skills you have built up over the decades not to mention the extensive range of specialist tools for the medium. One of these on my list as a 7mm scale model, so lovely to see it done so well in 4mm. Not tried citrus flux before, but certainly looks decent stuff. My Powerflux works a treat, but requires regular cleaning as I go along or everything will be green next day! Stainless steel sink cleaner does the job though. Its been an enjoyable build everything fits together so well, my only reservation is the thickness of brass is a bit whippy for the inside bearing under frame parts, I may assemble the 1st with putside bearings and a hollow middle axle to go round curves. Same problem with verdigris with the Saphire 'no clean flux" on brass, dipping the model in boiling or hot water seems to do the trick, without the need for detergent.